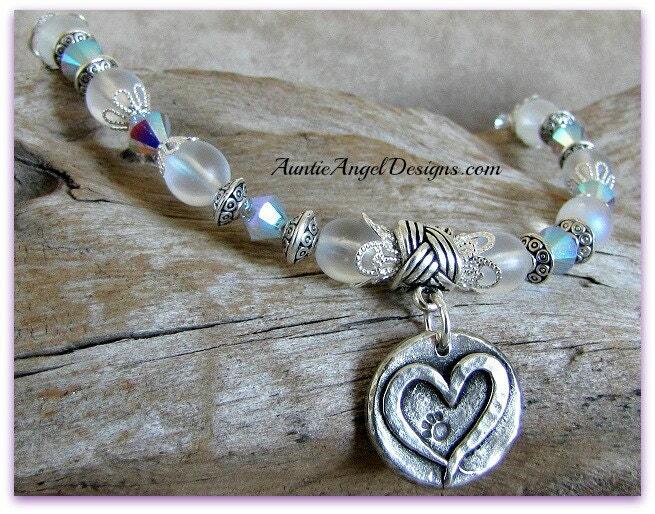 "Forever Paws: The Bracelet" is handmade by Auntie Angel for those who know that many of our angels are our furry friends who watch over us. Their unconditional love for us is pure and sweet. We are so blessed to have every one of them in our lives. When they leave this earth, they leave paw prints on our hearts. 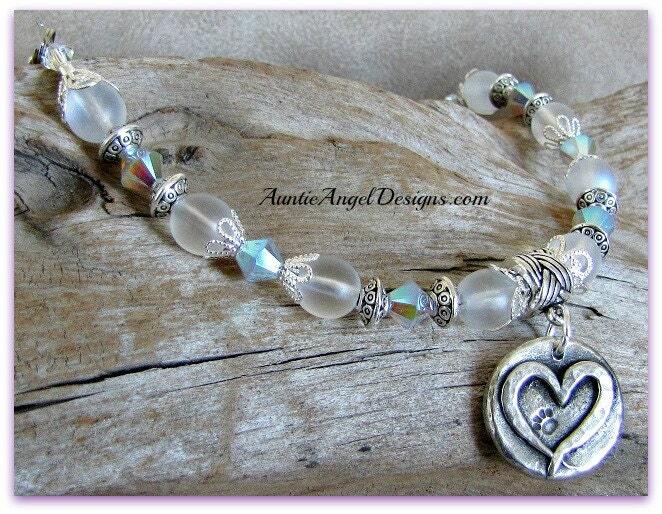 This absolutely brilliant and sparkly angel pet and spiritual pet-lover bracelet is strung with iridescent white beads, genuine Swarovski bicone beads and bright silver-plated filigree bead caps and decorative pewter saucer spacer beads. 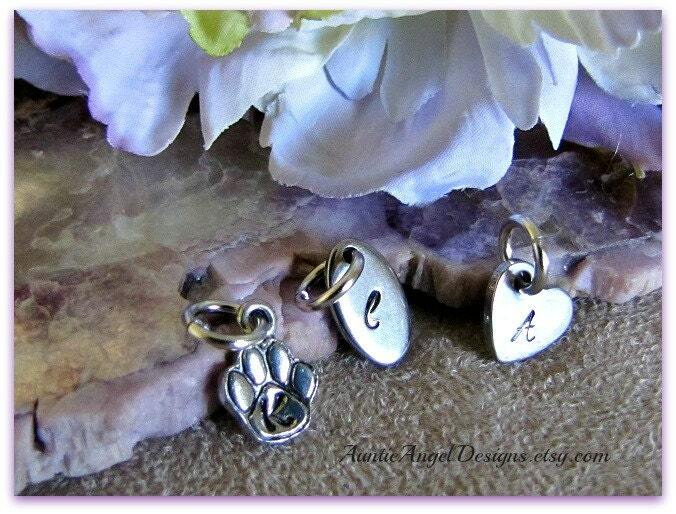 An artisan silver heart with paw print charm dangles from a ropelike pewter charm bail. 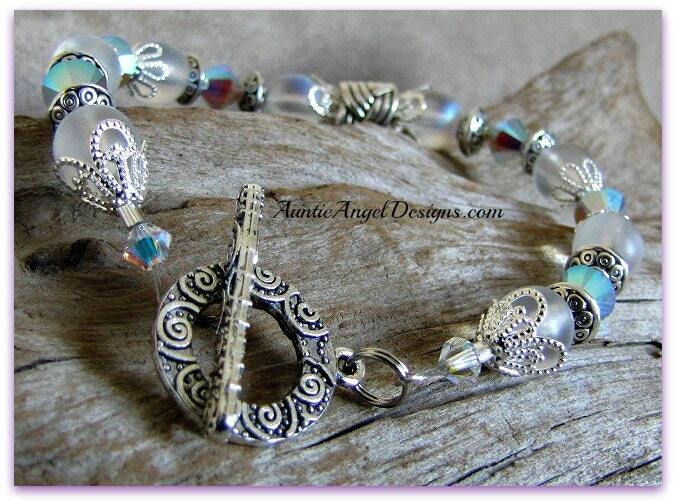 A sweet pewter swirl toggle clasp completes this classy, yet affordable piece. It truly is a sight to behold and a wonderful piece to wear anytime. Bead arrangements may vary depending on the size of the recipient's wrist. Please include your wrist size, NOT your bracelet size. "Forever Paws: The Bracelet" comes in its own gift box with ribbon and is ready for gift-giving. We include a small gift enclosure card and envelope for your heart-felt message to be handwritten on the card. Visit my Etsy sister shop at www.inlovingmemoryofyou.etsy.com for more memorial jewelry and gifts.